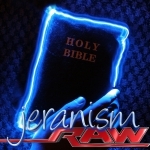 Jeran and Missa get Raw and talk about their feelings around the greatest book ever written. No, not 50 Shades of Gray, but the age old scriptures known as the Bible. A book that has lasted thousands of years and affected billions of lives must contain truth to get this far. But are we as humans ready to accept the fact that God doesn’t write books? We know that men write books and men lie. We also know that men don’t create worlds… Questions your beliefs, and join jeranism RAW every Monday at 9PM PST.